This very famous historic gets an unrefined finish for real use. Its the replica of what Gurkhas carried in world wars. This very famous among tourists and collectors because of the fact that it was actually used by Gurkha soldiers during world war I and II. This is the exact replica, the size, the shape and size of what they had before in the 1940s. 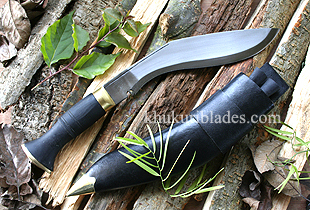 The reason of having this kukri unrefined is because of its well balanced weight and its special designed shape making it so easy to use with much effectiveness for rough use. It is also a size bigger than what they carry now giving it extra weight and extra length.